Some things just blow your mind. The phone rang late Monday afternoon. It was my mom calling from her hospital bed. Yes, from her hospital bed, checking in with us. Not at all what we expected given the weekend she had. On Saturday things had gone from bad to worse. My brother and sister had taken her back to ER. She was still confused and not making any sense of the world. The hospital ran tests, did a CT scan and reported that she had in fact had a minor stroke. We were devastated by the news. A neurologist saw her on Sunday. He evaluated her cognitive impairment. He looked at the CT scan. He told my siblings that he thought my mom had been experiencing dementia for a while (which she has) and that the stroke and UTI had pushed her into vascular dementia with Alzheimer's. He ordered an MRI, which she had on Sunday. We have not yet heard the results. Then, suddenly there were brief moments of lucidity late Sunday afternoon. She looked at photos of her grand-daughter's baby shower on my sister's phone. She was delighted with what she was seeing. She spoke coherently. She was still in a confused state, didn't know where she was exactly, but there was the hint of a spark in there. Monday morning, she remembered my father's name and that she had four children and their names. It was not easy, but she worked at it and got it right. I was still worried. Remembering my father's name and the rest is a pretty low bar for cognitive functioning. But we were thrilled. Later in the day my sister said my mom could carry on a bit of a conversation. Then, my older brother in Virginia called and said he had spoken with her on the phone. He said, "Robin, she's back. She's really back." I couldn't believe it. I thought it was wishful thinking. Then, the telephone rang here. I picked it up. It was my mom. "Hi Robin, and how are you?" "What, how am I? How are you? MOM (that's me shouting with glee! ), MOM, you're calling me up? How are you?" "I'm fine. I'm fine. I'm getting better." It was true. She was back! We have no idea what comes next, but we know my mother is a truly resilient remarkable amazing woman. And I thought I should let you know, friends. Thank you for your good wishes and kind thoughts. It meant the world to us. As if it wasn't enough that the new President has declared war on the environment on the fourth day of his term, or that he still insists that there was illegal voter fraud in the election (and yet it doesn't warrant an investigation), or that his staff thinks there are such things as alternative facts. No, on top of all of that my mother has gotten quite ill. Here she is just three weeks ago after her new haircut and styling. My sister sent me this photo, and I wrote back, "You tell mom I said va va va voom!" 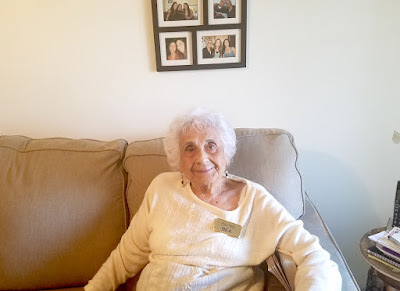 I thought she looked so good at 91 years of age. But my mom does have her health issues and had recently been prescribed a new medication to treat her suddenly and surprisingly high blood pressure. Well, after a just a week or two on that medication her blood pressure still soared, so her doctor increased the dosage. Uh-oh. Over the weekend my mom's mood changed noticeably. She was depressed. She didn't get dressed or go down to the dining room for meals. She sounded vague on the telephone. My mom was supposed to have a follow-up PET scan on Tuesday morning for her Follicular Lymphoma. My twin brother drove down from Santa Cruz on Monday to be with her and take her for the test. When he arrived she didn't really recognize him. She was not communicative with him or my sister. And things only got worse. At 12:30 am Tuesday morning, my brother woke to find my mom in the living room, heading out the front door into the hallway of the assisted living facility. She said she was going out there to get her bathrobe. He had to bring her back into the apartment. He called my sister and they agreed that she should go immediately to ER. Her confusion was quite profound. It took several hours for her to be able to answer questions correctly. They did a CT scan and determined that she had not had a stroke or a TIA. Her blood pressure was sky high, so she took a double dose when she got home from the hospital and went to sleep. When she woke up, she was back in the confused state. She couldn't remember my father's name (the love of her life). She tried again to go out the front door of the apartment, this time to find her hamper. And later in the day, she hallucinated chickens out her window. We think all of this can be attributed to a terrible side effect of her new blood pressure medication. We're hoping that once it is out of her system she will regain her memory and her sense of reality. Until then, we are all frantic and full of despair over this sudden decline in her health. On Saturday, just before things went terribly awry she said to me on the phone, "You know he's going to make things so bad. I'm not going to live to see it, but you will, Robin. Please, when I'm gone say out loud to me what he has done," I told her that I would. I said I would even write it down in my journals for her." She knew exactly what that meant. So yeah, the new President is just adding more pain to our already broken hearts. Thank you for listening, friends. We woke up Wednesday morning after a blustery night of stormy weather. With our little weather station on the roof, we could keep track of all the statistics: the fastest wind speed; the amount of rain fallen; the barometric pressure highs and lows. It's become a morning ritual to look at our little gauge screen and watch the monthly totals and yearly records of everything. We are definitely data junkies. But Wednesday morning we noticed that the rain gauge was saying that we had gotten two inches of rain when other weather stations in the area were reporting less than a half inch. We thought about the differences and remembered that our little glass rain gauge that we had on our fence for the past year often recorded amounts far higher than the techno measuring stations here. (Unfortunately, our little glass gauge had just recently cracked and had been rendered unusable by the below freezing temps earlier in the month.) So we cautiously dismissed the anomaly. We kept track of the pouring rain by both watching out the window and checking on this gauge. That's when we noticed that the numbers were getting very high very fast. We were adding inches by the hour while the other local weather stations were reporting much smaller amounts. Our weather station is linked to the website WeatherUnderground. So, anyone checking rainfall amounts in Arcata who came upon our little weather station statistics was being woefully misinformed. That's when we realized that we were actually generating Fake News. We were utterly embarrassed by it. Here is a screen shot of our data on the WeatherUnderground site. Click on that and see what we were reporting. By 3:00 it had gone up past 5 inches of rain. Yikes. Everywhere else was reporting no more than an inch and a half. Oh No, your station below has stopped sending us data. We have not received any weather observations since Jan 18 6:27 PM. We want you back! Well, Roger reconnected us on Thursday morning and the data so far has been fine and true. However, the monthly totals will be incorrect. We are considering how to adjust this. Maybe resetting on February 1st and giving up our first month of data. Not sure yet. Roger may climb back up on to the roof and check the station for any problems, once the weather permits such a thing. We're just glad that we stopped transmitting Fake News. In this day and age of rampant internet BS, it was good to shut ours down and err on the side of silence. PS-- We know this wasn't really fake news, it was unintentionally wrong. But we had a good laugh anyway. 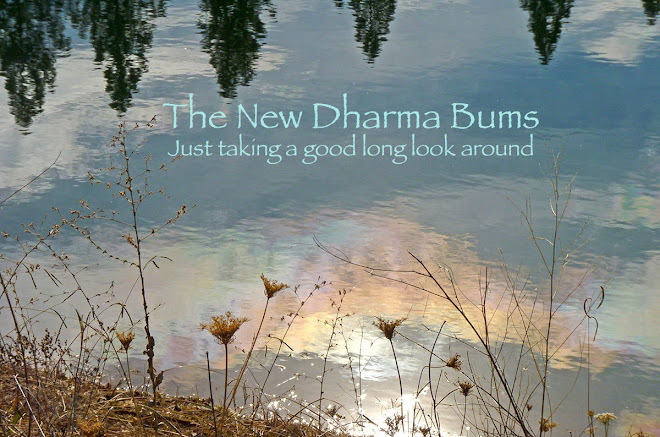 I wish I knew why I let the news of the world bum me out so much, because then maybe I could figure out how to rise above, be stronger, stay sane. I suspect it's already too late for that sane part, but I really need to work on rising above and being strong. We don't even have cable TV or a satellite dish to bring us the incessant news, but we do have these computers and they shout all the time. Even the sky has let me down. Not that it hasn't been beautiful (I mean take a look at these photos...hah! ), but the joy I usually feel is diminished by the reality of the times we are living in. I'm working on it, or trying to, or something. Here's the sky from three consecutive mornings. When I first saw this lacunosus formation, I thought this is what it would look like if the sky wrote us a love letter. I don't often photograph contrails, but this display in the rising sun was pretty dramatic. And, Tuesday's sunrise was the kind that makes you want to run out every minute just to catch all the changes. Even the cashier at the co-op asked us when we were checking out, "Did you guys see that sunrise this morning? I didn't even wait to turn on my big camera, I just started clicking away with my phone." Yes, it was that awesome. ... the sun came out, and we took a ride up the coast about ten miles to Luffenholz Beach to see the king tide. We had promised ourselves that we would do that, after we had walked the beach at a minus tide last July. This is what it looked like then on that foggy summer day. On Wednesday it looked so different. The waves were crashing against the rocks and flocks of gulls hugged the surf. It felt so good to get out there and sniff the ocean air and hear this incredible heartbeat of our earth as it moved in a gravitational dance with the moon and sun. We could see for miles, and it was beautiful in every direction. It was the very best way to spend an hour in the sunlight after a week of storms. It has been raining for days. Maybe it's been weeks or years, at this point I can't remember. A gray sky hardly changes, and the natural light is so dim that it requires houselights on all the time. Then night comes, and it is finally truly dark. Not much to do when it's like this, but play with old photos and remember days of light. 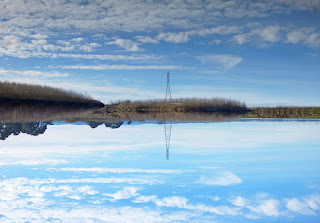 I started looking at a few photos of reflections of the sky in a few ponds at the marsh. I was looking at one and thought I should turn the laptop upside down to see if the reflection actually would look like the sky. What do you think? I flipped these photos. This is a bay view from the other day. I was going to delete it from my 20,000+ photo archive, but held on to it. I'm glad I did for the fun of it. Can you even tell which is the sky and which is the bay? What fun! So that's how I spent one rainy, gray day. Flipping old reflections could become a winter hobby! I saw the half moon rise in the sunlit sky. 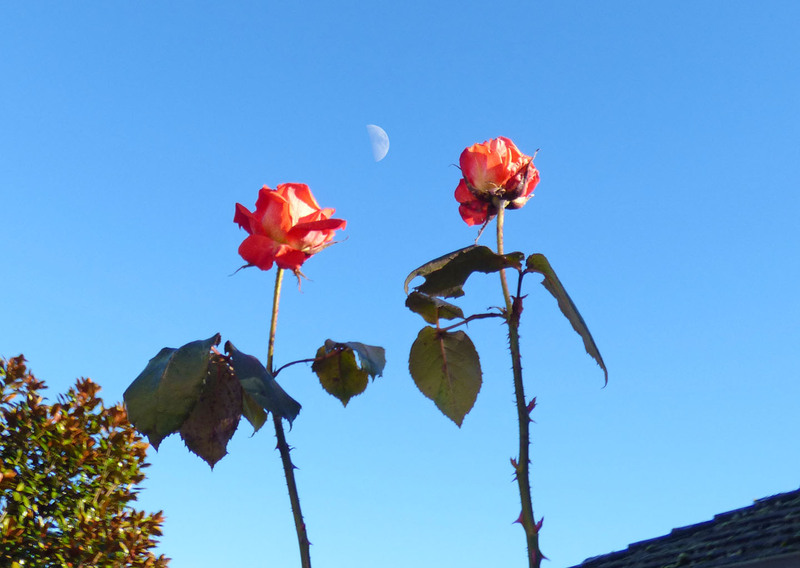 I saw the two crazy tall roses still blooming in the front yard. I tried to remember to photograph the moon if it showed up between the roses. We went for a walk with Elena and Ian. Ian loved the moon. He called it Luna, his cousin's name. He was perplexed that he could see the moon in daylight. It is a rather perplexing thing, isn't it? Elena and Ian went home, and Roger went out to the backyard to build another section of lattice to go over the fence for a bit more privacy from our neighbors on the west side of our house. Then I remembered-- the moon and roses. Ran out front for a photo. But to be perfectly honest, I had to photoshop this image. No matter how many times I tried to get the moon and flowers in focus together, I couldn't do it. Flowers close, moon far away. Hello? Are you crazy? Well, yes, I am. So I focused on the moon. And then I focused on the flowers. And then, I combined the photos with the trickery of the computers.